Inca Kola is an enormously popular drink in Peru. It smells and tastes quite a bit like Bubble Yum bubble gum, and has a sugar content surpassing Mountain Dew. It also possesses that highly valued yellow color.It is an essential part of any trip to Peruvian shores. Porci�n individual de refresco de soda Inca rico en cafe�na. I regularly buy these in packs of 36. Here they are pretty much the cheapest on the internet. Can't get enough of the stuff. 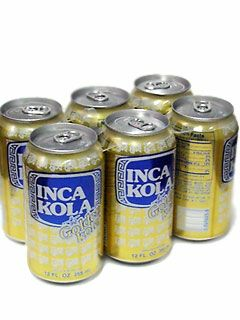 My Nephew returned from Peru and kept raving about this Peruvian drink called Inca Cola. I looked around the Internet. I found it at Mexgrocer.com. My Nephew was right, it is delicious !!! Taste like Bannana and Bubble gum. " It's the sweetest one"
GOOD STUFF! Went to Peru earlier this year and could not wait to find Inca Kola back here in the states. Took a few months to find it, and well worth it. Did NOT disappoint. This cola (or kola) is the best. I like to think of it as golden Mtn Dew. Give it a shot. It will give you a jolt.